Earlier this week, I’m sitting in Panera, watching a multi-generational family come in through the side door. The grandparents are wearing traditional African dress. I can’t place the country or region, but the man and woman both wear flowing garments in bright colors, and their heads are covered, his with a small, round cap. They did not buy their clothing at Target. They’re with two women in their thirties or so, one with young children of her own. Their daughters, I assume, are clearly protective of both their parents and the little ones, ushering them into the restaurant. Their clothing is American, but they both wear headscarves. They switch between accented English and their native language. And the little children? They are unmistakably American, wearing cartoon character-sneakers and glittery tee shirts. I don’t hear them speak, but I can’t imagine they’ll have an accent. I’m eavesdropping on the story of our country. Minutes later, I read this Swistle post: we gave our son a foreign name that’s proving difficult. Do we change it? We know what we know, and we forget that others have experiences that are worlds away – sometimes literally. In generations past, assimilation was the norm. My grandparents’ generation have two names – their Italian names at home, their American names that became the way we, their thoroughly American grandchildren, thought about them. For many families, assimilation feels urgent and necessary. There are negative consequences to standing out, and while they make me sad, ultimately I understand that the urge to fit in is strong. And yet, if there’s any gift of the wild diversity of naming children in the twenty-first century, it ought to be this: we can embrace the names of our cultures, and believe that they will be understood and respected by those we meet. Is this too optimistic? It’s the way I feel when I meet a person with a name I’ve never encountered, and I believe many of us feel that same way – curious, and excited that our world is, for a fleeting second, growing bigger. I’m curious to know: how have you dealt with foreign names? A great many families I know tuck them in the middle spot, or work hard to find names that span both cultures. I agree with Elea: Monty might be the next Archie … in the UK! Neither feels mainstream in the US … yet. Cecily Antonia Margaret – swoon! 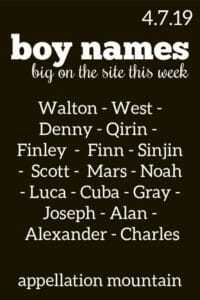 And lots of others in the current round-up of birth announcements from British Baby Names. One more from the UK: Gordon Ramsay and wife Tana welcomed Oscar James, their fifth child. An old post, but an interesting one on what it’s like to have a famous name. I think Duana’s answer to this question is spot on. 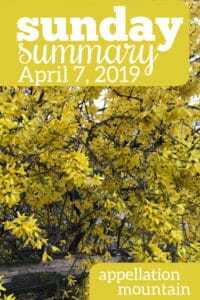 Why do I love this list of April namesakes so? I can’t say, but I do. 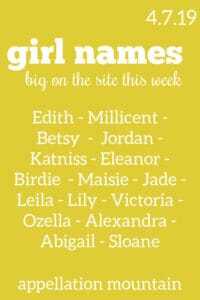 So many good names to borrow from books! Seriously outside-of-the-box picks in this video. There’s one I had honestly never considered – but kind of love. Loved Coast from the New Wave baby names video! It’s so evocative.